These raw chocolate pies are high in anti-oxidants are a great energy boost - and they come in a wide selection of delicious flavours. They are raw to retain all the nutrients traditionally associated with cacao. PLEASE NOTE: the Booster Bar is the only slice which is NOT gluten free because it contains barley grass and NOT vegan because it contains bee pollen. You can choose them to be the same flavour or all different, it's your choice! Dairy free, gluten free, vegetarian and vegan friendly, with no added sugar. They have a 5 month shelf life and need to be kept in the refrigerator. This pack contains 8 pies, 60g each. Booster Bar: Raw coconut oil, Raw agave nectar, Raw cacao nibs(16%), carob flour, Lucuma powder, Ground almonds, Barley grass powder (gluten), Bee pollen, Macca and Goji berries. Cardamom & Apricot: Raw coconut oil, Raw agave nectar, Raw cacao nibs (16%), Carob flour, Lucuma powder, Ground almonds, Apricots (15.3%), Cardamom(2%). Chilli: Raw coconut oil, Raw agave nectar, Raw cacao nibs (16%), Carob flour, Lucuma powder, Ground almonds, Raisins, chilli (1.5%). Coffee Smoothie: Raw coconut oil, Raw agave nectar, Raw cacao powder (18%), Carob flour, Ground almonds, Lucuma powder, Coffee (2.5%). Date & Walnut: Raw coconut oil, Raw agave nectar, Raw cacao nibs (16%), Carob flour, Lucuma powder, Ground almonds, Dates (15.4%), Walnuts (3.8%). Festive: Raw coconut oil, Raw agave nectar, Raw cacao nibs (16%), Carob flour, Cranberries (9.6%), Lucuma powder, Ground almonds, Brandy (2.4%), Cinnamon (1.8%), Nutmeg (0.3%). Ginger: Raw coconut oil, Raw agave nectar, Raw cacao nibs (16%), Carob flour, Ground almonds, Lucuma powder, Ginger (3.8%). Goji & Pumpkin Seed: Raw coconut oil, Raw agave nectar, Raw cacao nibs (16%), Carob flour, Goji berries (9.4%), Lucuma powder, Pumpkin seeds (5.5%), Ground almonds. Naked Pie: Raw coconut oil, Raw agave nectar, Raw cacao nibs (18%), Carob flour, Ground almonds, Lucuma powder. Nut Pie:Raw coconut oil, Raw agave nectar, Raw cacao nibs, Carob flour, Nuts ( Brazil, walnuts, hazelnuts, almonds, pecans,cashew nuts ) (10%), Lucuma powder, Ground almonds. Peppermint: Raw coconut oil, Raw agave nectar, Raw cacao nibs (16%), Carob Flour, Lucuma Powder, Ground almonds, Xylitol, Peppermint essence (2.4%). Pink Himalayan Salt: Raw coconut oil, Raw agave nectar, Raw cacao nibs (16%), Carob flour, Lucuma powder, Ground almonds, Pink Himalayan salt (1.2%). Seed & Cacao Pie: Raw cacao nibs (19%), Pumpkin seed (19%), Raw coconut oil, Cranberries, Apricots, Raw agave nectar, Ground almonds, Sunflower seeds (4.5%), Hemp hearts (4.5%). This product contains NUTS. PLEASE NOTE: The Booster Bar is NOT gluten free because it contains barley grass and NOT vegan because it contains bee pollen. I actually bought these for someone else as a gift and my husband and I couldn’t resist them! I have to say my favourite was the vanilla, it tasted like Christmas in America which we do every year! Highly recommended. 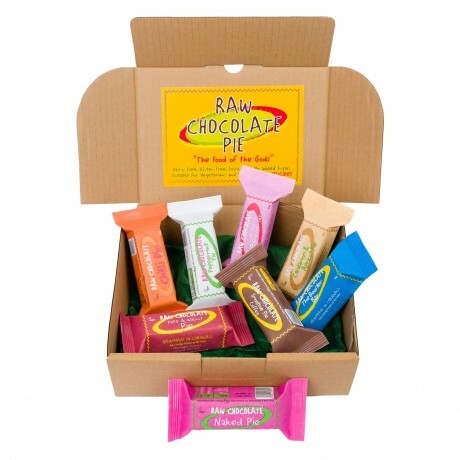 Delighted to have found the Raw Chocolate Pie Company online!! We initially found The Raw Chocolate Pie company during a trip to Cornwall earlier in the year and as my daughter is vegan we decided to buy her some for Easter. After trying a few samples ourselves we ended up buying pies for the whole family! They're really delicious! The only downside to ordering online is that there isn't a mix and match option for ordering both fudge pies and the chocolate pies together. There was a problem with the parcel however Debby very quickly sorted this out and sent a free bar as an apology. Only tried a couple of flavours so far but the vanilla fudge is amazing!!! Texture and flavour a great replacement for traditional fudge in fact this beats it hand down so worth every penny!!! I have a subscription to the 10 bar pack and looks like a large number will be this flavour!! (Mind you only tried vanilla fudge and ginger so far lol!! I found some Raw Chocolate Pie bars in the fridge last time I was home and ate them without knowing Mum had brought them all the way back from Cornwall as a treat for herself. Buying one lot to replace the pies I had accidentally stolen, I doubled up and bought myself a box as well. Far nicer than traditional chocolate, and a small portion goes a lot further. Love the Himalayan salt bar and can't wait to try some more flavours next time! The only small thing was my order was slightly wrong (I ordered 2 cocoa nib and seed pie and 2 smooth coffee & received 4 coffee flavoured bars). Got this as a Christmas present for my other half and she seems very happy with them. She's eaten most of them already on the day! I ordered these and only got half of what I ordered. I ordered these and only got half of what I ordered. Box of 8! Brought for a friend, she was very happy. Dairy free, gluten free, soya free raw chocolate treats with no added sugar - unique, handmade and delicious!